Many scholars believe our culture and experiences shape who we are. Considering that to be true, Faustine Williams, Ph.D., M.P.H., M.S., has masterfully harnessed her life’s perspectives into capabilities and reform. Born and raised in Ghana, West Africa, Dr. Williams recalls being engrossed in science since childhood. She was also interested in subjects that involved any calculation: accounting, chemistry, economics, and physics. As a youth in Ghana, Dr. Williams was not eligible to attend school until the age of 6, so her father, a mathematician, taught her at home. While in fourth grade, she was solving middle school math problems. “My dad was my greatest influence,” she said. “I wanted to be a good mathematician like him,” she added. Her focus slightly changed during the mid-1980’s at the onset of dracunculiasis in her country. Known as “guinea worm,” this parasitic infection comes from drinking unfiltered water that contains water fleas contaminated with guinea worm larvae. A taskforce assembled by the World Health Organization and the International Task Force for Disease Eradication, Carter Center, convened a training, and she was the youngest to participate—at the age of 13. She traveled to many villages, providing education on water filtration and other preventive measures. Working alongside her father, this was her first taste of public health awareness. Soon, she began to have an increased interest in social issues. From bringing extra food to school for those less fortunate, to handing out clothes to those in need, Dr. Williams set in motion what would quickly become a shift toward a future career in research to help the underserved. Dr. Williams continued her studies after high school at Ghana’s School of Hygiene, earning a Bachelor of Science in environmental health. She went on to earn a Bachelor of Arts in information science from the University of Ghana. Her graduate studies commenced in the United States at the University of Missouri, where she earned a Master of Science degree in health informatics, a Master of Public Health degree and a doctorate in social sciences. 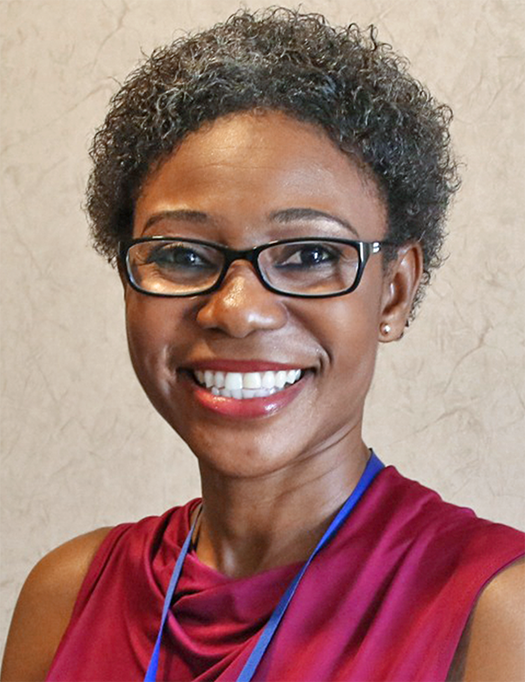 Following a postdoctoral fellowship within the Cancer Prevention and Control Training Program of Washington University’s Public Health Sciences Division, Dr. Williams’ commitment to research in the area of minority health vastly increased. “Personally, I believe we cannot solve the issues of minority health and health disparities without increasing the number of minorities pursuing these careers,” she said. “To do this, we must broaden diversity in the workforce,” she continued. Now as a Stadtman tenure-track investigator within the Division of Intramural Research of the National Institute on Minority Health and Health Disparities (NIMHD), Dr. Williams contributes to the Intramural Research Program’s high-risk/high-impact health disparities research in the area of community and population health. Her lab focuses on health disparities and geospatial transdisciplinary research to understand the factors influencing health disparities and develop effective interventions to improve health outcomes among minorities and underserved populations. Also a 2018 NIH Distinguished Scholar, Dr. Williams participates in a cohort model for enhancing diversity and inclusion of principal investigators in the NIH Intramural Research Program. The competitive program provides mentoring and professional development activities to foster research and promote scientific workforce diversity. Dr. Williams says her goal is to build a well-established transdisciplinary research program with other NIH intramural scientists. Dr. Williams aims to build a long and productive career, working toward helping to eliminate disparities so that everyone can benefit from good health. But there is still a lot of work to do. She credits NIMHD for affording her the career opportunity to carry out her dream of helping people.